Distinguishing Features: This fish is bright rusty orange overall with reticulating blue lines over the body and fins. The orange darkens to blue/black on the lower side with the dark area usually being more pronounced in males. Males also tend to have bluer fins as well as more elongated bodies. Origin: Endemic to Hawaiian waters and the Johnson Atoll. Natural Habitat: They inhabit reef slopes, rocky ledges, and rubble areas. They live in clear water from 10-150’. Feeding Requirements: In the wild these fish primarily eat algae and detritus. In captivity these fish are very shy at first, and it can be difficult to get them to eat prepared foods. Having an established reef aquarium with plenty of live rock for grazing helps as they transition to prepared foods. Once they settle in they become bolder and should eventually begin sampling prepared foods including flakes, pellets, and frozen preparations. They will eat almost anything once they take to the idea that food can come from the sky. Some specimens may pick at coral (especially LPS) as well as feather dusters, clams, and anemones. (1 = easy - 5 = hard) For the advanced aquarist with well established reef tank. I rate this fish a "3." Careful selection of this fish is recommended. If possible choose a well fleshed, brightly colored, alert individual that has been at the store a minimum of two weeks, and (preferably) already eats prepared foods. (1 = shy - 5 = nasty) I rate this fish a “2.” These fish can be quite shy and should be kept with peaceful tank-mates. They will likely show strong aggression to others of their kind or to other Centropyge angels. While it is possible to keep them in harems, pairs, or with other Centropyge angels, this type of mixing should be left to the advanced aquarist. 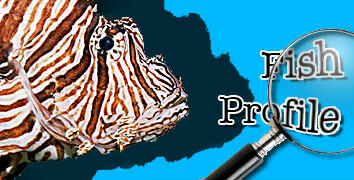 Captive Requirements: These fish do best in established reef tanks. Standard reef tank parameters are optimal. A tank of at least 30 gallons with plenty of live rock is recommended. They should be housed with non-aggressive tank mates. They appreciate many openings in the rock work and will weave their way in and out of the rocks. Once they are more comfortable in their new environment they may become open water swimmers rather than the shy “peek-a-boo” fish they start out as. Once established they are fairly hardy. Optional Requirements: These fish will appreciate feedings of seaweed sheets rubber banded to a rock or clipped to the glass. There are several frozen Angel & Butterfly foods on the market that may be beneficial. 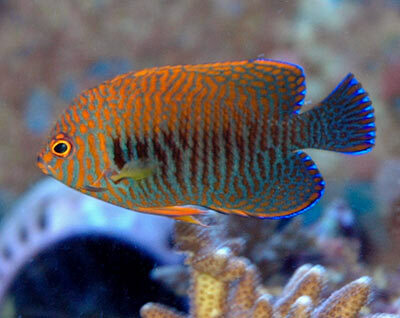 Reef Tank Compatibility: It should be noted that while this fish has a better survival rate in a reef aquarium, it is not 100% reef safe and may pick at corals and other invertebrates including clams and fan worms. Some individuals will cause considerable problems in a reef tank, and some never bother anything. Notes: The Potter’s Angelfish, like others Centropyge angels, is an egg laying, synchronous protogynic hermaphrodite. They start out sexually undifferentiated and develop into females, with the most dominant transforming to male. They are generally found in harems with a dominant male and several females. Retailers sometimes offer male/female pairs of Potter’s Angelfish for sale. Some types of Centropyge angelfish have been successfully bred and reared in captivity including the Flame Angel and the Lemon Peel Angel. I have not been able to find any reports on the captive breeding of the Potter’s Angelfish at this time. According to Kevin Kohen, Director of LiveAquaria at Drs. Foster & Smith, many of the difficulties associated with Centropyge potteri acclimating to captivity can be directly related to collection methods, improper decompression, transport, and holding prior to export. As with all Centropyge angelfish, Potter’s Angelfish have a sharp cheek spine on their gill flap that is easily caught in nets. If possible avoid capturing this fish with a net as it may cause injury to the fish. Note: All of the above information has been compiled from various sources and should be used as a guideline, not a hardfast rule. Use caution when selecting animals for your own tank and research as much as possible before purchasing any animals. Remember that certain corals and fish are very hard to keep if their special requirements are not met. The information contained here is to help you make an informed decision. The author assumes no responsibility for any consequences that may arise from the use of this information.